Sugar-free candy, nutrition bars, cookies, cakes and other sweets might be sugar-free, but they do contain sugar substitutes, many of which can cause diarrhea, especially sugar alcohols. Artificial sweeteners such as aspartame and sucralose can also cause diarrhea in some people,b but sugar alcohols are more likely to induce diarrhea. When you eat foods containing sugar alcohols, be aware that you might experience sudden, explosive diarrhea if you eat too much. Sugar alcohols are neither sugar nor alcohol, despite the name. Sugar alcohols, also called polyols, are natural sweeteners that have a similar chemical structure to both sugar and alcohol. They're used as artificial sweeteners because they have half the calories of regular sweeteners. The reduced calorie count comes from the fact that they're incompletely absorbed. Incomplete absorption is also the cause of their diarrheal effects. Like fiber, they pull fluid into the colon, diluting the stool and causing watery diarrhea. Several types of sugar alcohols are used as sweeteners in diet foods, including sorbitol, mannitol, maltitol and lactitol. Others include isomalt, xylitol and erythritol. These sweeteners vary in their calorie count per gram and their sweetness compared with sugar. Regular sugar contains 4 calories per gram. 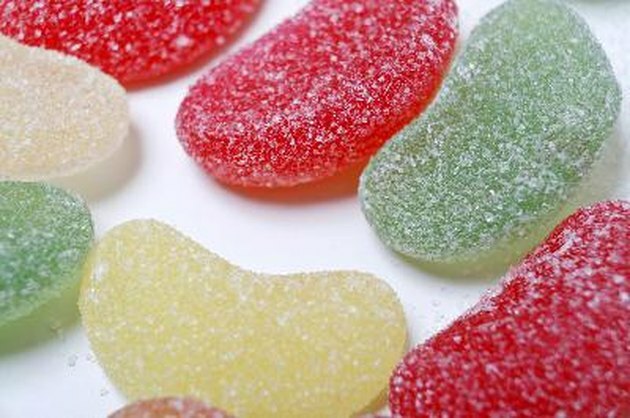 Isomalt, lactitol and maltitol each has about 2 calories per gram, while xylitol has 2.4 and sorbitol 2.6. Mannitol has 1.6 calories per gram, and erythritol has the least, just 0.3 calories per gram. However, the less sweet the product, the more of it that must be used to get the required taste. Maltitol is the sweetest, 90 percent as sweet as sugar, while lactitol is the least sweet, 30 to 40 percent as sweet as sugar. Isomalt, mannitol and sorbitol fall between 45 and 70 percent of sugar's sweetness and erythritol is 60 to 80 percent as sweet. The Academy of Nutrition and Dietetics says consuming more than 50 grams of sorbitol or 20 grams of mannitol can cause diarrhea. The U.S. Food and Drug Administration currently requires warning labels about the laxative properties of sugar alcohols only on products containing this amount. However, many people experience symptoms at much lower doses of between 10 and 50 grams of sorbitol, the Center for Science in the Public Interest reports. The American Academy of Pediatric Dentistry reports that doses of 30 to 60 grams of xylitol have caused diarrhea; abdominal pain, gas and bloating can also occur. In a study published in the September 1985 issue of the "American Journal of Gastroenterology," researchers reported that 10 grams of sorbitol caused abdominal pain, bloating and diarrhea in 43 percent of whites and 55 percent of nonwhites, while severe clinical intolerance occurred in 4 percent of whites and 32 percent of non-whites. Can Artificial Sweetners Upset Your Stomach?